Home > Events > 2016 Montclair Jazz Festival! 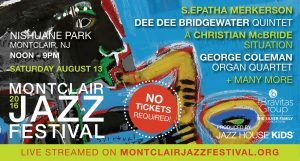 29 Jul 2016 Montclair Jazz Festival! No tickets required! Presented by The Bravitas Group Inc./Silver Family Foundation and produced by Jazz House Kids, the Montclair Jazz Festival is quickly becoming one of the most exciting summer events in the region! Hosted by 5-time GRAMMY-Award winning bassist Christian McBride, with award-winning actor & mistress of ceremonies S. Epatha Merkerson and festival announcer WBGO Jazz 88.3’s Gary Walker, Bravitas Main Stage highlights include Dee Dee Bridgewater Quintet, A Christian McBride Situation with DJ Logic and Bernard Purdie, George Coleman Organ Quartet, Michele Rosewoman + New Yor-Uba, the Jazz House Faculty Collective performing Prince and Bowie, featuring Louis Prima, Jr. with the Jazz House Big Bands and performances by more than 150 Jazz House Kids students in award-winning ensembles and vocal groups. The all-day event also includes the North Coast Brewing Company beer tent; an expanded Family Jazz Discovery Zone with partners, the Montclair Art Museum and Montclair Public Library & Foundation, shuttle service from parking areas in Montclair and West Orange, a Diamond Cycle Montclair bike valet, dozens of concessions, a post-festival jam party at Egan & Sons, West Orange. Bring your family and make a day of it! If you can’t make it to the park in Montclair, stream it LIVE on www.montclairjazzfestival.org.